The SURFACE with Metal Kickstand Combo comes with the SURFACE with Metal Kickstand Case and SURFACE Holster. The SURFACE with Metal Kickstand has been redesigned to make it even better and still kept the sleek design you have come to know and love. The SURFACE with Metal Kickstand features an amazingly thin, shock absorbent TPU inner layer that completely encases your phone and features our Hexguard Technology that provides extra cushioning during impact. An outer Polycarbonate layer slides into place, like our original SURFACE design, protecting against scratches and abrasions while our signature soft-touch coating gives an elegant look and feel to the device. The built-in metal kickstand can be used in landscape orientation for a hands-free experience when viewing multimedia, managing photo slideshows, and displaying clocks and calendars. The magnetic kickstand provides convenience by easily snapping back in when not in use. (The SURFACE with Metal kickstand does not support the device in portrait orientation.) Slip the case into a secure spring-clip SURFACE holster for the ultimate carrying solution for your device. The SURFACE with Metal Kickstand offers an unmatched combination of durable protection, sleek design, and elegant finish. 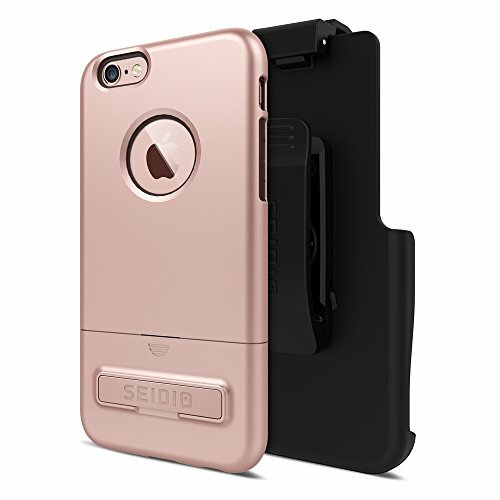 If you have any questions about this product by Seidio, contact us by completing and submitting the form below. If you are looking for a specif part number, please include it with your message.